It just seems the responsible thing to do to promote a picture of a solar geyser installation. Although their market share is not yet very significant, it is growing on a daily basis. If you are in the market place to replace yours, you should do the right thing and investigate the ‘green option’. Dial A Contractor’s geyser / boiler repair and installation contractors will assist with all the up to date information – you choose. For those of us who are restricted by body corporates and aesthetic housing or security estate regulations, it will be easier to stick to the old fashioned attic mounted boilers. When installing a new hot water cylinder or solar water heating system be sure to ask about service maintenance and part availability, as these days there are far to many makes and models of everything including water boiler options. Imports may seem cheap until the smallest thing goes wrong, then they become disposable and your credit card takes another bending because you fell into the ‘no-name’ trap. Dial A Contractor’s water heater installation and repair specialists will only recommend tried, trusted and reliable geysers and water heaters be sure – stick with Dial A Contractor. Do you have water dripping through the ceiling? Water running over top of your roof? Sounds like you may have a burst or leaking geyser. 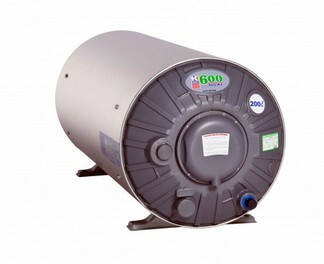 We supply and fit 50, 100, 150, 200l Geyser for Residential and Commercial Customers. Geyser Legislation As per the SA Government Gazette No. 22355, Notice No. 509 and Regulation No. 7079 dated the 8th June 2001, all fixed electrical storage water heating systems must comply to SANS 10254 installation specifications (SANS – South Africa National Standards.) 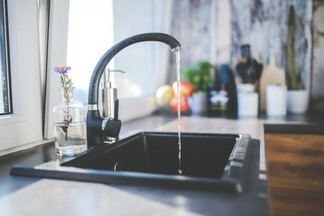 The legislation requires that all new geyser installations and replacement geyser installations performed after 8 June 2001 must be in accordance with the specifications, which requires the installation to have a geyser drip tray with overflow pipe piped to the exterior of the building. Vacuum breakers must be installed on the hot and cold water supply and the overflow from the safety valve and expansion relief valve must be piped to the exterior of the building. A Solar Water Heating system uses the sun’s energy to heat household water in place of the conventional electric geyser. Water heated by the sun can reach temperatures exceeding 100 ºC if sized or installed correctly. The normal temperature for household use is 55ºC to 65ºC. Are there different kinds of Solar Water Heating Systems? Solar Water Heating Systems are basically divided into two kinds of systems: direct or indirect. A direct system is when the water to be heated is circulated directly through the solar collectors. An indirect system is when the water is heated indirectly. This is done by circulating an anti-freeze heating fluid through the solar collectors which is heated and then the heat from the fluid is transfer to the water through one method or another. In areas where frost can occur, an indirect solar water heating system must be installed so as to prevent freezing of the solar collector. Are there different kinds of Solar Water Heating system configurations? Solar Water Heating Systems direct or indirect can be divided into two kinds of configurations: thermo syphon or pumped. In a thermosyphon configuration the the SWH cylinder is located above the solar collector hereby allowing unassisted or natural circulation. No mechanical parts are present in this circulation method. Pump systems utilize a pump to achieve circulation. In these systems the SWH cylinder is located below the solar collector therefore requiring assistance in circulation. Will solar heating affect how much water I will have and will I have to change my bathing and cleaning routine? Yes and No. If the Solar Water Heating system is sized and installed correctly it can cater for all your family’s hot water needs with minimal lifestyle changes. A boosting element such as an electrical element with a timer should be installed to cater for period’s when additional heating is required. Can my existing electrical geyser be used? What happens on cloudy days and winter periods? Why do I need a timer switch with my Solar Water Heating system? To maximise the solar contribution during sunshine hours whilst still ensuring hot water during inclement weather a timer should be fitted. The timer will allow for the backup electrical supply to the Solar Water Heating System cylinder to be isolated during the sunshine hours. Does Solar Water Heating system need maintenance? Yes. A Solar Water Heating system would require minimal maintenance to maintain optimal energy efficiencies. On average the maintenance periods can vary between 12 and 18 months but will also be dependent on the type of system or configuration installed, the water conditions and the type of solar collector/panels install. The supplier/manufacturer guidelines on maintenance should be considered before purchasing a Solar Water Heating system. Yes. The current Eskom rebate is available which can vary anything between R4000 and R10 000 depending on the type of SWH system installed. Terms and Conditions apply to qualify for the rebate. 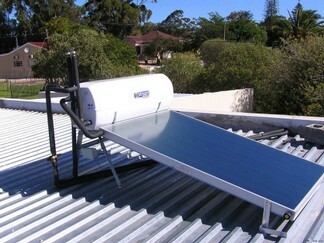 How long does it take for a Solar Water Heating system to pay for itself? Solar Water Heating System does have a payback, and it can vary from three to ten years. But it may be more useful to think of SWH System as an investment that yields an annual return, much as a bank savings account provides interest. A solar water heater will generate savings that can equal a bank account generating between a ten (10%) and twenty percent (20%) annual return, and the savings are not taxed as income, as is the interest you earn at the bank. The truth is, if you want hot water… you will be paying for that heat. You may prefer to pay your electrical bill forever, or you may wish instead to go solar, and become generator of your water heating. Solar Water Heating is simply the best investment available today because it guarantees a return on money that you will otherwise “burn” and helps you develop equity as you bank your savings. What is a burst geyser? Bursting can be defined as “to break or cause to break open or apart suddenly and noisily, especially from internal pressure: explode”. Lets face it: Geysers do not usually explode or burst. They corrode and eventually give in. Simple wear and tear and corrosion are spend up by lack of maintenance – this is the stark reality. In order to prolong the lifespan of the geyser, it is advisable to have the geyser serviced every three to four years where the water supply is of a good quality and every second year where the water supply is of a bad quality or the water is defined as hard water. A regular service would be the draining of they geyser, checking on the level of degradation of the Magnesium sacrificial anode and replacing it if necessary, checking the element and thermostat and to replace the element if there is excessive lime scale build on the element. 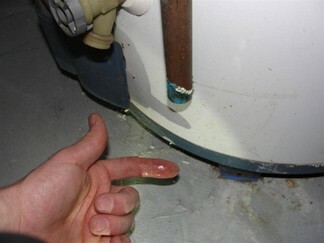 Lime scale and sludge must be removed from the tank and the entire installation should be checked for leaks. Is it detrimental to the geyser to switch it “on” and “off” all the time? This will have no adverse effect as the geyser has a mechanical thermostat that is constantly switching on and off by nature of its operations. Ideal setting is 50 to 55 degrees in summer and 60 to 65 degrees in winter. The setting should never be lower that 50 degrees as will promote bacterial growth in the water. My geyser burst WHAT NOW? This will normally happen at 3am in the morning, on a public holiday or over a long weekend … such is life. In the event of a geyser bursting and water coming through the ceilings, light fitting or down the walls, a four point action plan is advisable. 3. 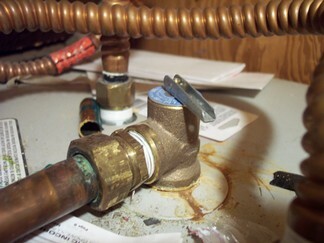 If possible, look through the trapdoor to see whether the geyser, the pressure reducing valve, or the pipes are leaking. Possible savings on electricity bill? If it rains and there is cloud cover what happens? The heat pump will be effective regardless of cloud cover or not. Ensuring the installer insulates all hot water pipes will also minimise the heat loss. Where is a heat pump installed? A heat pump is installed within 8 metres of the geyser on a wall or on the floor with enough space around it to draw in air. The unit is the same size as an air conditioner. Is there still an element in the geyser involved? 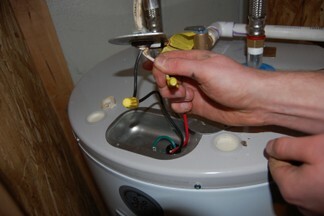 An element is installed in the geyser as a backup if the heat pump should fail. Can the existing geyser be used with the green alternative? The heat pump will be connected to an existing geyser and mounted on an existing wall up to 8 metres away from the geyser or hot water storage device. How will the electrics be installed? 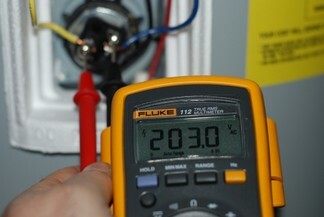 The Heat Pump Specialist will appoint a qualified Electrician to attend to the electrical work. The existing electric geyser will determine the size of heat pump needed. 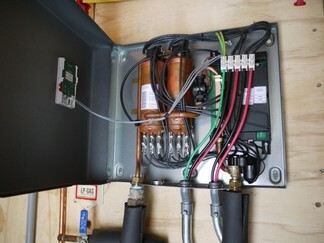 For a 100lt to 250lt geyser you use a 5.5kW heat pump and on a bigger geyser you will use a 7.5kW heat pump. How long will it take to get my investment back? Depending on the amount spent on the system, the average period for heat pump is just under two years.